Creating voice-overs has never been easier. Adjusting the volume of a spoken word in a video can be time-consuming. At Audified, we thought there could be a much easier way to edit voice-overs. Just add music and SpeakUp. SpeakUp has emerged from the necessity to simplify the process of creating voiceovers and YouTube shows. 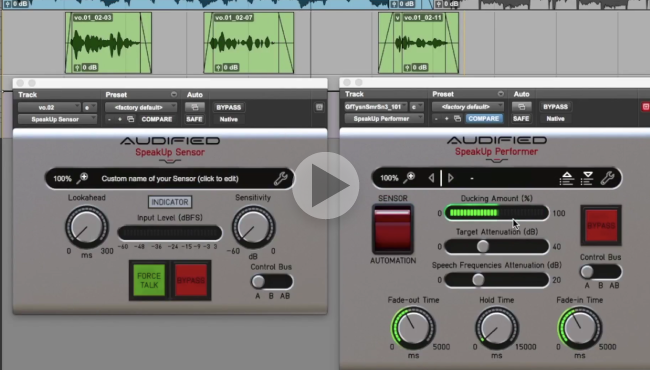 SpeakUp plugin bundle does exactly that. 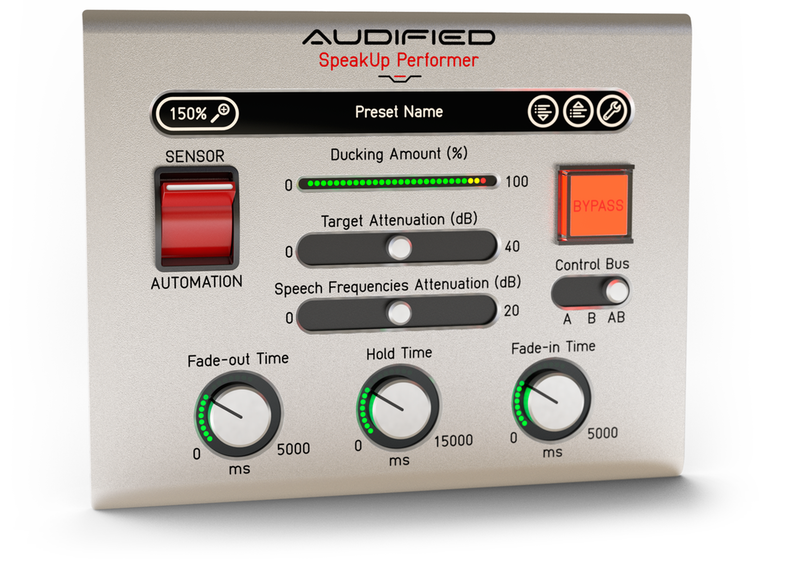 Applying the SpeakUp Sensor plugin on the speech track and SpeakUp Performer on the music allows you to focus only on what is really important - your show. User friendly control allows you to adjust the plug-in behavior to suit you the best. Do They Hear What You Say? Some video editors spend hours of their precious time by adjusting the volume perfectly. We kept them in mind. The responsive plugins assure the ideal blend of voice, background sounds and music. SpeakUp was composed by professionals. For professionals. Voice-over projects takes a long time to prepare and it is not the most creative part of show production. And being radio-show-hosts is not easy while you have to master the multitasking skill to controll the music and advertisements while doing talk-show. Easy to use tool that covers the technicality while allowing you to focus on show itself is not available. SpeakUp, the unique tool that makes it all for you. So you can focus on the more important parts of your project. Lookahead - tell the Sensor plugin how much to delay the speech so the music fades-out before the speech in the final render. Control Bus - choose up to two independent control busses if you need sophisticated scenario. Driven by your will - write Ducking Amount parameter automation curve directly to your DAW (in Sensor Mode), modify it or even redraw it from scratch. Then just let the SpeakUp Automation mode do its magic. Performer is only controlled by the Ducking Amount parameter value read from DAW, Sensor signals have no effect in this mode.